CUMBERLAND — Maybe it was a Red Hat Lady wanting to announce the date and time of the group’s next meeting. Or it could have been a person from some garden club with information about a tour. Then again the visitor may have been somebody from the Kiwanis or St. Mary Catholic Church or Rotary or the Women’s Civic Club. 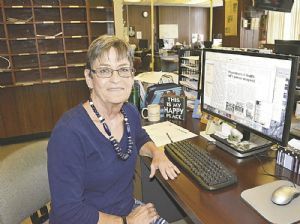 For 39 years, community news about chicken dinners and raffles and card clubs and the like found its way onto the pages of the Cumberland Evening Times and then the Cumberland Times-News after passing across the desk of Debbie Haan. Haan, on Friday, retired after nearly four decades as the community news editor at the corner of Baltimore and Mechanic streets. “When I got out of college I said I’d rather clean toilets than work for a newspaper,” Haan said on Thursday. Haan graduated from Allegany High School in 1972 and from West Virginia University in 1979 with a journalism degree with an emphasis on advertising. “I wanted to go to New York. I wanted to make radio and TV commercials,” she said. Family commitments, though, kept her in the Cumberland area and that same year she was hired at the newspaper. She said things didn’t start well and at lunch on the first day she told a co-worker she wasn’t going back. “I meant I wasn’t even going back after lunch. I was overwhelmed with everything the job required,” Haan explained. But she did go back after a lunch at Curtis Coney Island Famous Weiners. “Actually I didn’t want to tell my dad I had quit my job during my first day,” she said. The job certainly required interaction with the readership. Until recent years when public access to the Times-News was restricted for security reasons, representatives of volunteer fire companies, pageant committees, Cub Scout packs, swim teams and many, many others simply entered on the South Mechanic Street side of the building and climbed the steps to the second-floor newsroom. “Jan (former managing editor Jan Alderton) moved me to the first desk by the door because of that,” Haan said. Haan said she was given news releases handwritten on a variety of items such as napkins and placemats. “Sometimes people would stand there and dictate the information to me,” she said. “One woman who calls always tells me a dirty joke before she gives me her news. And then there were the weddings and the engagements. Haan said she remembers the first time she received a wedding announcement that was one year after that actual event. “I thought ‘I guess they wanted to see if it worked out before they said anything.’ Then it started happening all the time. It became a trend. I can’t explain it. Then there was the staple of a community news page, the five-generation photograph. “We had a lot of those, but in all this time I’ve had only four six-generation pictures,” she said. Haan said she will miss her co-workers and the people on the downtown mall she would see and came to know, not always by name. Haan and her husband, David Knoche, semi-retired as owner of Bel Air Servicecenter, plan to travel, definitely to Florida, but perhaps also via a land cruise across the USA. “I’ll be spending as much time as possible with my great-nephew,” she said of Jakob Brooks, 7, who lives nearby in Short Gap, West Virginia. And, after 39 years at the keyboard, she said this.